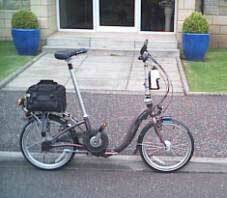 I wrote in July 2002, and you kindly published my views on the (then) new Dahon Speed Pro. I really enjoyed that cycle and toured quite a few miles around Scotland until July, 2004. While out with a CTC group on the last day of a week long tour, just after lunch, I was cycling on a single track road - signed as a Cycle Route - and while negotiating a sharp left hand bend - with a 4 foot stone wall at the road edge on the left and a steep drop to a River at the road edge on the right, I was confronted with a LandRover towing a Cattle Trailer. The Trailer was as wide as the road and quite a bit wider than the LandRover. Result, NO space for me to pass. I avoided the Landrover but ran slap bang into the front offside of the trailer. I was unconscious until just before the ambulance arrived, with intermittent periods of unconsciousness in the ambulance during the 30 miles to Perth Royal Infirmary. There they diagnosed a fractured clavicle at right shoulder end, three fractured ribs on right side, multiple bruising of trunk, difficulty in breathing. After Casualty, where Morphine was injected, I woke up the next morning about 05:00. Determined to rise, it took me until 08:00 just to get up and sit on the edge of the bed. I remained in the Infirmary for 4 days then released to care of a family member who drove me home. My helmet was smashed to "smithereens" in the accident, BUT I SUFFERED NO INJURY TO THE HEAD, just stiffness of the neck and shoulders, which is now minimal to non-existant after use during the following two years of my "Tens" pain relief equipment. I AM CONVINCED THAT I WOULD NOT BE WRITING THIS HAD I NOT BEEN WEARING A HELMET AT THE TIME OF MY ACCIDENT. The only residual effect I now have is that at Perth Infirmary they gave me the wrong Arm Sling and instructions. Result, my Clavicle did not knit and my GP told me, 2 months later, that it never will. On the bright side, although the fracture ends are loose, I have no pain and use both arms as normal. My GP did mention possible onset of arthritis and for that I take a daily Cod Liver Oil capsule. Happily no sign of Arthritis so far. The Speed Pro came through the accident very well. Obviously a very strong machine with the paint not even scratched, while the Aluminium Carrier (buckled) and Eurolights (smashed) required replacing. After the accident I persevered and from an original (very difficult) 20 yard walk have now progressed to being able to walk about 10 miles. Resuming Cycling took a little longer. I found that when I first tried cycling, I was not really enjoying it. I persevered, but was still somewhat hesitant to go out on the Speed Pro. Early in 2007 I began considering if my hesitancy might be Speed Pro based. In May, 2007, I made a decision and for my 75th Birthday contacted Mark Bickerton of Cyclemotion and purchased a Dahon Ciao P8. During 2007 made several trips and worked up to about 20 miles a trip and again began enjoying cycling. Still not doing much over 20 miles a trip, but getting better every time – cannot wait for the better weather in 2008, as I have regained almost all of my confidence and am actually looking forward to getting out and about on the Ciao P8. I find little difference between the 24 gears of the Speed Pro and the 8 of the CIAO. The updated catches and cushioned seat pillar are very good. I have fitted the CIAO with a Eurolight of Monmouh system which includes rear light, brake light, flashing yellow turn indicators, and Cat Eye left and right rear view mirrors. It is amazing that, at any roundabout, using the flashing indicators (which are “Hands Free” and Vehicle drivers understand) allows other vehicles to know where you are going and overtake readily when turning onto or off a roundabout. My only criticism of the Ciao is that the magnetic catch does come apart at awkward times when the cycle is folded. I much prefer the firm hold of the old Speed Pro Velcro webbing strap. All in all the Ciao is a beautiful machine, well made and the puncture proof tyres are a great bonus - I used to have a puncture about every two months, but now, have not had one since July 2007. Congratulations to all at Dahon and Cyclemotion for allowing me the very great pleasure of once again enjoying my cycling.